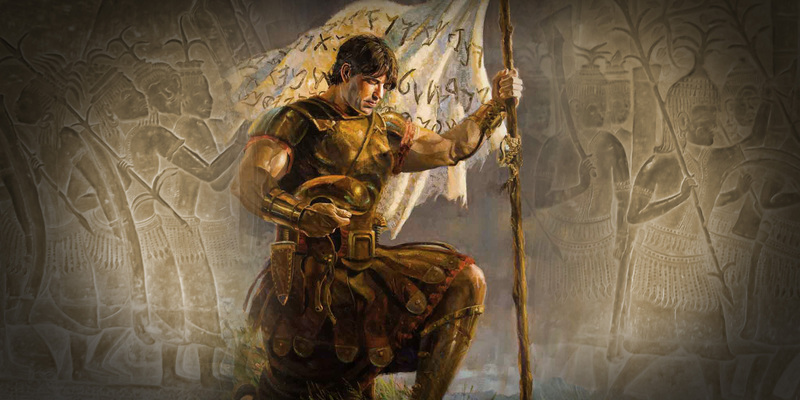 After including in his record much of Alma’s counsel to his three sons, Mormon picked up where he had left off in giving his historical narrative report “of the wars between the Nephites and the Lamanites” (Alma 43:3). Nearly all of the remainder of the book of Alma (Alma 43–62) gives one detailed account after another of battles and strategies used during a period of extensive warfare. At the head of the armies at this pivotal time was one Moroni, who “took the command of all the armies of the Nephites” at the age of 25, in the eighteenth year of the Nephite reign of judges (Alma 43:16–17). Despite his youth, Moroni proved to be an effective military commander. There seem to be two reasons for Moroni’s success: (1) he implemented innovative defensive measures; and (2) he sought and followed prophetic counsel. The first innovation mentioned is the protective armor with which Moroni equipped his men (Alma 43:19). Earlier mentions of armor are rare and vague. David E. Spencer, a professor of counterterrorism and insurgency, suggested that prior to this point, individual soldiers were responsible for arming themselves. This probably resulted in uneven or inadequate armor for the rank-in-file. Under Moroni’s command, each soldier was equipped with a full ensemble of protective gear, which included breastplates, arm-shields, head-shields, and thick clothing. Moroni also built extensive fortifications, with ditches, earthen walls, and palisades (see Alma 49–50). Like armor, fortifications had been known among the Nephites at an earlier time, but they are only briefly mentioned and only in the Land of Nephi. Mormon reported that Moroni’s fortifications were “in a manner which never had been known among the children of Lehi” (Alma 49:8). Moroni also rallied the people behind a righteous cause, and raised a battle standard upon a pole to represent that cause (Alma 46). Using a battle standard allowed for greater cohesion and unity on the battlefield. Never before was the use of a battle standard mentioned among the Nephites. Each of these innovations may have been borrowed from nearby cultures or earlier antecedents which had previously been forgotten. For example, a similar ensemble of armor was known in pre-Columbian Mesoamerica. Comparable earthwork fortifications are known among the Israelites and various pre-Columbian American cultures, and in Mesoamerica, a proliferation of such fortifications can be confidently dated to the Late Preclassic period, coinciding with the time of Moroni. Battle standards are also well attested in many cultures from both the Old and New Worlds, including the Israelites and Mesoamerican peoples. In addition to the physical preparations, Moroni sought and followed the guidance of the Lord. Before going to rally the people with his battle standard, “he bowed himself to the earth, and he prayed mightily unto his God” (Alma 46:13). In the first battle under his command, he “sent certain men” to the prophet, Alma, “that he should inquire of the Lord whither the armies of the Nephites should go to defend themselves against the Lamanites” (Alma 43:23). As a result, the Lord revealed the activities of the Lamanite army, and Moroni was able put his troops in place to cut off the Lamanite soldiers. Moroni was not the first to draw on the prophet for guidance in wartime (see Alma 16:5–6). In fact, he was part of a long-standing Israelite and ancient Near Eastern tradition. While innovative in so many ways on the battlefield, he proved willing to continue on in righteous traditions like this one, much to his benefit and success. Neal Elwood Lambert, “Moroni1,” in Book of Mormon Reference Companion, ed. Dennis L. Largey (Salt Lake City, UT: Deseret Book, 2003), 556–557. Elder Joe J. Christensen, “Captain Moroni, an Authentic Hero,” in Heroes from the Book of Mormon (Salt Lake City, UT: Bookcraft, 1995), 128–133. Thomas R. Valletta, “The Captain and the Covenant,” in The Book of Mormon: Alma, “The Testimony of the Word”, ed. Monte S. Nyman and Charles D. Tate Jr. (Provo, UT: Religious Studies Center, Brigham Young University, 1992), 223–248. Dean Garrett, “Inspired by a Better Cause,” in Book of Mormon, Part 2: Alma 30 to Moroni, ed. Kent P. Jackson, Studies in Scripture: Volume 8 (Salt Lake City, UT: Deseret Book, 1988), 69–79. Douglas J. Bell, Defenders of Faith: The Book of Mormon from a Soldier’s Perspective (Springville, UT: Cedar Fort, 2012), 135. In contrast, the Lamanites are said to be “naked, save it were a skin which was girded about their loins” (Alma 43:20). According to Ross Hassig, War and Society in Ancient Mesoamerica (Berkeley and Los Angeles, CA: University of California Press, 1992), 73, Maya of the Classic period and (presumably, earlier) generally did not use armor. David E. Spencer, Captain Moroni’s Command: Dynamics of Warfare in the Book of Mormon (Springville, UT: Cedar Fort, 2015), 14. Alternatively, armor may have been more limited and less protective before Moroni introduced the full ensemble of armor mentioned in Alma 43:19. William J. Hamblin, “Armor in the Book of Mormon,” in Warfare in the Book of Mormon, ed. Stephen D. Ricks and William J. Hamblin (Salt Lake City and Provo, UT: Deseret Book and FARMS, 1990), 404–410 reviews the Nephite system of armor. For a full detailing of passages mentioning and describing fortifications in the Book of Mormon, see John L. Sorenson, “Fortifications in the Book of Mormon Account Compared with Mesoamerican Fortifications,” in Warfare in the Book of Mormon, 438–443. See Jacob 7:25; Jarom 1:7. Walls are mentioned in Mosiah 7:10; 9:8; 21:19; and 22:6, also all in the Land of Nephi. Based on the “astonished” reaction of the Lamanites (Alma 49:5, cf. vv. 8–9, 14), it seems none of the cities in the Land of Zarahemla had previously been fortified. Hassig, War and Society in Ancient Mesoamerica, 64 and 97 understood a lack of evidence for battle standards as a lack of formal military units and formations. See Hamblin, “Armor in the Book of Mormon,” 410–416; John L. Sorenson, Mormon’s Codex: An Ancient American Book (Salt Lake City and Provo, UT: Deseret Book and Neal A. Maxwell Institute, 2013), 418–419; John L. Sorenson, Images of Ancient America: Visualizing Book of Mormon Life (Provo UT: FARMS, 1998), 130–131. Aztec armor is described in Ross Hassig, Aztec Warfare: Imperial Expansion and Political Control (Norman, OK: University of Oklahoma Press, 1988), 85–90. According to Dorie Reents-Budet, Painting the Maya Universe: Royal Ceramics of the Classic Period (Durham, NC: Duke University Press, 1994), 259, one Mayan vase (K2352) depicts what is likely “a type of body protection stuffed with cotton or reinforced in some other manner, similar to the effective armor worn by the later Aztec.” Interestingly, their enemies are depicted wearing nothing but a loin cloth, as Brant A. Gardner, Second Witness: Analytical and Contextual Commentary on the Book of Mormon, 6 vols. (Salt Lake City, UT: Greg Kofford Books, 2007), 4:575. Hassig, War and Society in Ancient Mesoamerica, 82–84 discusses similar armor (specifically the thick, quilted armor) at Teotihuacan as early AD 450. On pp. 197–198 n.22, Hassig noted that “West Mexican cultures produced realistic ceramic figures, among which well-accoutered warriors are prominent.” These warrior figurines “are shown wearing what is described as ‘barrel armor’ because of its shape, which protects the trunk but not the limbs. Judging by the sewn closures, this armor was constructed of leather or fabric.” The dating of these figurines is uncertain, but they are stylistically “attributed to the Late Formative” (i.e., Late Preclassic). Hassig pointed out, this artistic style “may well have extended through the Classic,” thus urging caution that “the martial traits shown may not be from the Formative era.” Although uncertain, the evidence is nonetheless suggestive of fabric, or thick-clothing armor dating to Moroni’s time period. Spencer, Captain Moroni’s Command, 20–32 describes and comments on the fortifications of Moroni, including images of pre-Columbian forts from both North and Mesoamerica. For a fairly detailed treatment of fortifications in the Heartland region, see David E. Jones, Native North American Armor, Shields, and Fortifications (Austin, TX: University of Texas Press, 2004), 50–57, 125–135. He documents Native American forts in the Northeast and Southeast with earthen walls, palisades, bastion towers, therefore similar to those of Moroni. For examples from Mesoamerica, see James N. Ambrosino, Traci Ardren, and Travis W. Stanton, “The History of Warfare at Yaxuná,” in Ancient Mesoamerican Warfare, ed. M. Kathryn Brown and Travis W. Stanton (New York, NY: AltaMira Press, 2003), 110–112; Payson D. Sheets, “Warfare in Ancient Mesoamerica: A Summary View,” Ancient Mesoamerican Warfare, 291; Also see Sorenson, Mormon’s Codex, 405–410; Sorenson, Images of Ancient America, 132–133. For Israelite fortifications compared to Book of Mormon ones, see John E. Kammeyer, The Art of Nephite War (Far West Publications, 2014), chapter 11. See Sorenson, “Fortifications in the Book of Mormon,” 429, table 2. On p. 430, table 3 displays the features of fortifications by period, showing that all the features described in the Book of Mormon are attested in the Late Preclassic. Sorenson also documents fortifications by region (p. 426–427, table 1). Based on all three lines of data, Sorenson concluded, “Evidently all the features mentioned or inferred above for the Book of Mormon complexes one through five were present already during the Mesoamerican Late Pre-Classic or Proto-Classic periods, the archaeological periods coinciding with the Book of Mormon occurrences. In terms of geography, if we accept for the moment a general spatial correlation between Book of Mormon lands and Mesoamerica, we can see broad agreement. We do not yet have sufficient chronological control to pin down when fortifications appeared in many of the regions of Mesoamerica, but it is generally apparent that known archaeological sites display the right sorts of military technology to agree with the Book of Mormon account” (p. 437). Takeshi Inomata and Daniela Triadan, “Culture and Practice of War in Maya Society,” in Warfare in Cultural Context: Practice, Agency, and the Archaeology of Violence, ed. Axel E. Nielsen and William H. Walker (Tucson, AZ: University of Arizona Press, 2009), 66–69 also note that fortifications become most common during the Late Preclassic phase; and Hassig, War and Society in Ancient Mesoamerica, 32–44 documents fortifications in various regions of Mesoamerica, concluding, “during the Late Formative, the general sophistication of warfare in Mesoamerica increased” (p. 44). This will be explored more in depth in KnoWhy 158. See Hugh Nibley, The Prophetic Book of Mormon, The Collected Works of Hugh Nibley: Volume 8 (Salt Lake City and Provo, UT: Deseret Book and FARMS, 1989), 92–95; William J. Hamblin, “The Importance of Warfare in Book of Mormon Studies,” in Warfare in the Book of Mormon, 491–492; Sorenson, Mormon’s Codex, 109–110, 421; Kammeyer, The Art of Nephite War, chapter 14; Kerry Hull, “War Banners: A Mesoamerican Context for the Title of Liberty,” Journal of Book of Mormon Studies 24 (2015): 84–118. The use of banners in ancient Near Eastern warfare can also be seen in William J. Hamblin, Warfare in the Ancient Near East to 1600 BC: Holy Warriors at the Dawn of History (New York, NY: Routledge, 2006), 40, 221, 247, 271, 292, 326, 330. For “standard-bearers” in Egyptian warfare, see Anthony J. Spalinger, War in Ancient Egypt: The New Kingdom (Oxford, Eng. : Blackwell Publishing, 2005), 156, 177, 221. For “standards” as a feature of Mesoamerican warfare, see Hassig, War and Society in Ancient Mesoamerica, 50–51, 128, 140, 143, 148, 150, 152, 153, 162. For Aztec specifically, see Hassig, Aztec Warfare, 5, 42, 57, 58, 96, 97, 283 n.66, 293 n.20. For war banners in earlier Mesoamerican warfare, see F. Kent Reilly and James F. Garber, “The Symbolic Representation of Warfare in Formative Period Mesoamerica,” in Ancient Mesoameican Warfare, 127–128. See Hugh Nibley, Since Cumorah, The Collected Works of Hugh Nibley: Volume 7 (Salt Lake City and Provo, UT: Deseret Book and FARMS, 1988), 242; Stephen D. Ricks, “‘Holy War’: The Sacral Ideology of War in the Book of Mormon and in the Ancient Near East,” in Warfare in the Book of Mormon, 103–110. Also see Sorenson, Mormon’s Codex, 387–389; Hamblin, Warfare in the Ancient Near East to 1600 BC, 107. While it is reported that Moroni’s preparations for war “had [never] been known among the children of Lehi” (Alma 49:8) before, that does not mean they were not known within the region among others. For the presence and influence of others in the Book of Mormon, see Book of Mormon Central, “Did Interactions with ‘Others’ Influence Nephi’s Selections of Isaiah? (2 Nephi 24:1; Isaiah 14:1),” KnoWhy 45 (March 2, 2016); John L. Sorenson, “When Lehi’s Party Arrived in the Land, Did They Find Others There?” Journal of Book of Mormon Studies 1, no. 1 (1992): 1–34; Matthew Roper, “Nephi’s Neighbors: Book of Mormon Peoples and PreColumbian Populations,” FARMS Review 15, no. 2 (2003): 91–128; John Gee and Matthew Roper, “‘I Did Liken All Scriptures Unto Us’: Early Nephite Understandings of Isaiah and Implications for ‘Others’ in the Land,” in The Fulness of the Gospel: Foundational Teachings from the Book of Mormon, ed. Camille Fronk, Brian M. Hauglid, Patty A. Smith, and Thomas A. Wayment (Salt Lake City and Provo, UT: Deseret Book and Religious Studies Center, Brigham Young University, 2003), 51–65. David A. Bednar, “The Hearts of the Children Shall Turn,” Ensign, November, 2011, 27; online at lds.org. For evidence of the Nephites’ righteousness directly leading to success in battle, see Alma 43:45–50. John Bytheway, Righteous Warriors: Lessons from the War Chapters in the Book of Mormon (Salt Lake City, UT: Deseret Book, 2004), 13. President Russell M. Nelson, “Becoming True Millennials,” Worldwide Devotional for Young Adults, January 10, 2016, at lds.org. President Nelson, “Becoming True Millennials,” at lds.org.